Hey I was wondering where you got those balloon icons. Are those from finalbossblues? Because I can't find them on their site. I believe I got them from his patreon. the $5 a month option gives you access to A LOT more assets in his style. Glad you liked the icons! I really enjoyed this game very much! I really liked how I was able to apprentice different types of activities. My favorite activity was the fighting system and forging; however, the fighting system was kind of hard. But honestly, this probably might just be my terrible game playing skills. I wish I could have done more with the farming. If I had known about the restriction of farming on the different days I would have chosen to do farming from the start. The writing was absolutely beautiful and I like how you wrote Shiori's backstory. It was absolutely beautiful and brought tears to my eyes. Overall, amazing game! Great job! I really liked this game, up to the part where I, too, fell victim to Jet standing in the damn way. I feel like this game has a good basis, but it's also got a lot of little issues that hamper the experience. Obviously, it's a marvel how much of the game you were able to put together, but at the same time, many of the activities were just downright boring. Fishing, for instance, just involves having the right items and standing in the right place, then crossing your fingers. In fact, the whole apprentice thing doesn't really pay off in any interesting gameplay. I liked the writing, tho I felt like a lot (most?) of it was first draft. That, again, is understandable given the time constraint. (This might just be a personal preference, but I really dislike getting a text box with the last word of a sentence in it and nothing else. Either rewrite the text box to be more concise or add more text.) I'm really interested in seeing where this goes, so I'll be keeping on eye on the game page! Good luck on the contest, btw, you have one of the more promising games I've played. As for the boringness of fishing, YES. Definitely. 100% with you there. I plan to create a mini game for it, and many more varied rods you need with many different types of fishing grounds. The fishing will tie in a lot more to the cooking system too, making a key system that will tie into the fighting aspects. As far as the writing, you caught me. I did unfortunately have to use a lot of first drafts in this. It being my first published game, I didn't have the knowledge I do now on how to more quickly enter in written dialogue. I now have quite a few tricks I plan to implement in the future!! Especially in regards to the text box. I feel like I got much better flow in the newest game I made for a jam. I really need to redo this game from the floor up with all the comments people have given me. It really means a lot that so many of you have enjoyed my game!! I plan to expand it to potentially be my first commercial game (though again it won't be for awhile. I acknowledge that this is a good showing of my limits and where I need to improve). I plan to have the apprenticeships expand into Matsuki's adulthood and how she deals with the events that happen at the end of the game! While I succeeded in fleshing out all the systems I wanted, it's fair to critique just how bare bones a lot of it is. I'm amazed I finished as much as I did, but I genuinely should have polished it more. I really appreciate you taking the time to comment. This feedback really helps me as a developer!! I did really enjoy the game, and I plan on playing this demo to the end at some point, I just ran out of time this weekend and wanted to give it a rating before the contest was over. I'm sorry if I came off harsh in my critique, you have one of the best entries I've seen and I'm really looking forward to seeing it develop. Your game really has a lot of potential, and it's already very charming and fun to play. Oh no harshness was detected! You were honest! I began to really respond to all the critiques I had on this game. I'm very excited to see its final ranking and use that as motivation! I really enjoyed playing through your game! It has all my favorite things: witty dialog, a crafting system that satisfies your every need and different types of jobs/career paths! I love that our character gets 5 days to get to know a bit of all the available professions in the village.. it was a fun way to get new skills and new crafts.. and also a way to get to know everyone! I wish you luck on the contest! 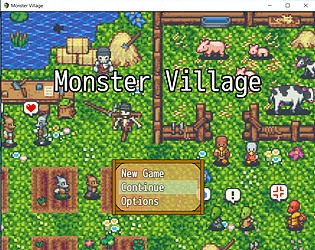 I really had lots of fun playing the game and I look forward to see what sort of plans you have for Monster Village after the IGMC is over.. I hope you'll continue it! 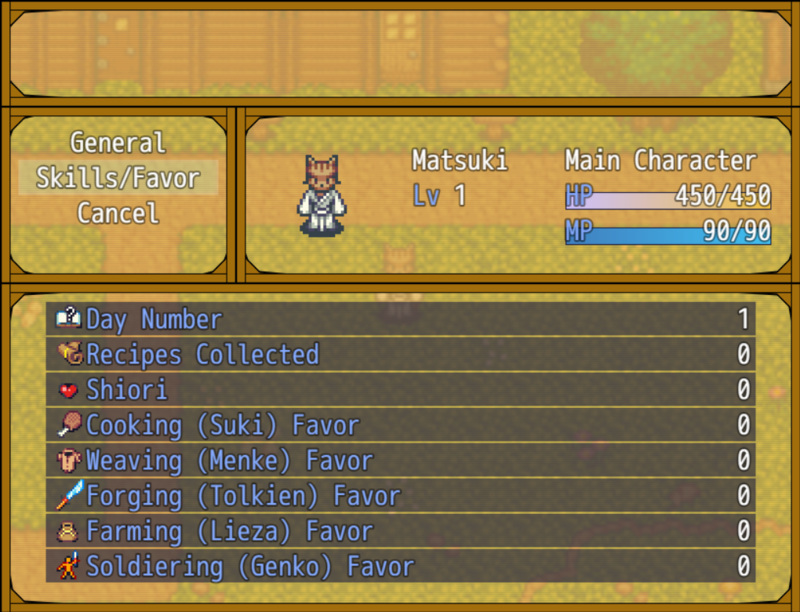 I really wanna play Matsu as grown up.. finding ways to avenge her village.. :) Good luck! I appreciate this so much!! I feel like you really got what I was going for! I know of the bugs it currently has and do plan to fix them after the contest is over. I'm grateful that you would be interested in a sequel, I'm seeing how it's responded to on here to see if it's worth doing, but so far it seems like there's people out there who would love it! Nice little game! The playful dialogue was fun. I liked the mapping too. Like someone else said, the village really does feel like its own place in the world! If there is only one ending, I can see this game heading in an interesting direction! A most interesting direction indeed. FINAL VERDICT: Are humans...the real monsters? I'm so glad you liked it! There is alternate wording for the endings, but overall it ends the same! I'm so glad you enjoyed the ending! A sequel would clean up the bugs I know of and expand on her life after the events of the ending, and how her chosen apprenticeship affects this. Did an episode of Monster village. The story hasn't gripped me yet, it a bit slow. Battle system is hard, not sure if i missed equipment, its too early to leave village or its badly optimized. Dialogue needs work, noticed some grammar mistakes, some spaces forgotten and using numbers instead of words. but mapping seems ok. I also like that you control a cat instead of a human. Also sound effect when moving the cursor is very annoying. I appreciate you having done a review of my game! I'll be sure to take your criticism into consideration when fixing it up after the contest, thank you!! I hope a future remake will be to your liking! Alright lets get into this review for SS2018 and I am sure some of this if not all of it has already been said. 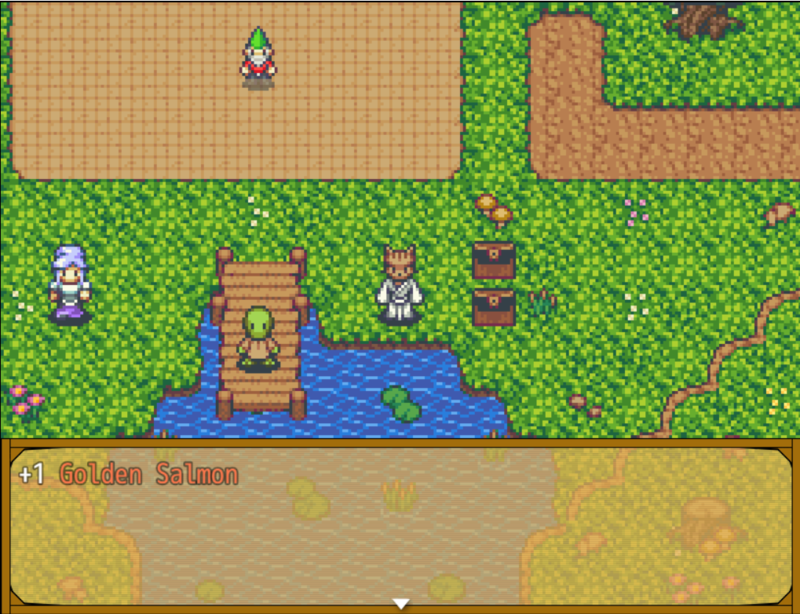 Sprites, Tile set, and dialog boxes tied in well together. I am happy to see that it feels like it's not a mishmash of different art styles from different games. Being an artist it's one of the things that drive me nuts is when everything looks out of place and there is no art direction. Music is very whimsical and pleasant to listen to. Kind of relaxing. Suits the kind of art style and game you are trying to make as well. I enjoyed the aspect of having different classes/jobs you could choose from. I love farming, crafting, and resource hunting games so it appealed to that side of me. I am a survivor at heart. Enters and Exits. As some have stated before I have gotten stuck in the cave because a little gnome was hanging outside ogling the cave. Easily fixed if you just set him over one tile in any direction. I had to restart my game because of this. The dialog. While I know some might not agree with me I felt the dialog was very.... forced. I can tell it's trying to be whimsical and get you to like the characters but it's as if something is missing. It's hit or miss with it. (Course it might just be me) Specially with the best friend. The dialog doesn't seem to flow naturally as the characters interact with each other. I do like the Orc and Mummy's dialog though. While you say you could build a relationship with that friend into something more it kind of feels like that relationship is already there and it feels really awkward. But it is possible that you didn't have time to work on it or something. A little build up and tension towards this kind of flirting would be nice. Feel like you earned it! The tavern is almost always empty and I am sad that it is. Lots of great character interactions can happen there. How are they making money at all if the tavern is always empty? I wish you could have made Matsuki say something with a little more impact to Genko when he was insulting her father. I am not sure if what was said is really growing a backbone and standing up for the person you love. Maybe something more along the lines of. "Stop insulting my father in such a manner! You shouldn't judge someone just because they believe differently than you do. Now, if that's all you have for me I will be taking my leave!" Maybe not exactly like that but I hope you get what I am saying. I mean he was being rather harsh. I really wish this was able to be a larger screen than just the square box. Maybe wider... Mainly because I feel a bit claustrophobic with all that dialog and such packed in there. There are times when the dialog box blocks the list of selections and makes it hard to read. Widening the screen might help with that. Over all I did enjoy the game. Many things could be easily fixed that I mentioned and I am looking forwards to seeing where this goes. Keep up the awesome work! Thank you very much for your feedback! So many more cutscenes were planned and cut!! It's unfortunate, but I appreciate your honesty about the characters. I tried to really make them likeable and I'm happy to know where that didn't quite land. I'm still debating if it's worth it to make a sequel, but I will definitely be fixing the small bugs I know of!! Thank you so much for this marvelous review, it made my day when I read it! T_T You're so nice thank you! So I got this game assigned at the Secret Santa 2018 thread. I like the artstyle and its resolution very much, but I didn't really like the 4:3 aspect ratio (prefer 16:9). Aside from some collision glitches and a good amount of tile passibility bugs, the systems implemented in this game work surprisingly well together. But something I do want to point out is that it would be really nice to put a character in front of the forest which prevents the player from walking in unarmed. That was the first thing I did the first 2 tries and died immediately at the first encounter (also, please make a custom game over screen and choose another font, they don't go well with the artstyle). I also would've liked to see diagonal movement, be or with diagonal sprites or not. The first few minutes (and still a bit) the goal of the game were a bit unclear to me. But that passed away rather quickly as I followed the game and did what it told me to do. Overall the game was just fine but I don't really know how it would expand to not be an Animal Crossing clone with some classic style rpg fighting elements which I'm not sure of people in that genre would like to play (also if ABS is implemented, it's about the fighting aspect itself). That's a great suggestion in regards to the fighting system! I'm embarrassed to admit it was implemented last and not given the proper attention it deserved. I can still make some things clearer to the game, and have a running list of things to fix or finish once the contest has ended. In regards to how it would expand, maybe I didn't make the "to be continued" ending clear enough? The idea was to have a vibrant village with lots of optional game play (thus constituting her last days as a teenager/not-quite adult), while the "post game" (2nd chapter more like) is her response to the ending and her subsequent adulthood. What apprenticeship did she choose and how will that further affect her life and how she deals with the events in the ending? What skills did she neglect to learn and how will that further affect her path in life? 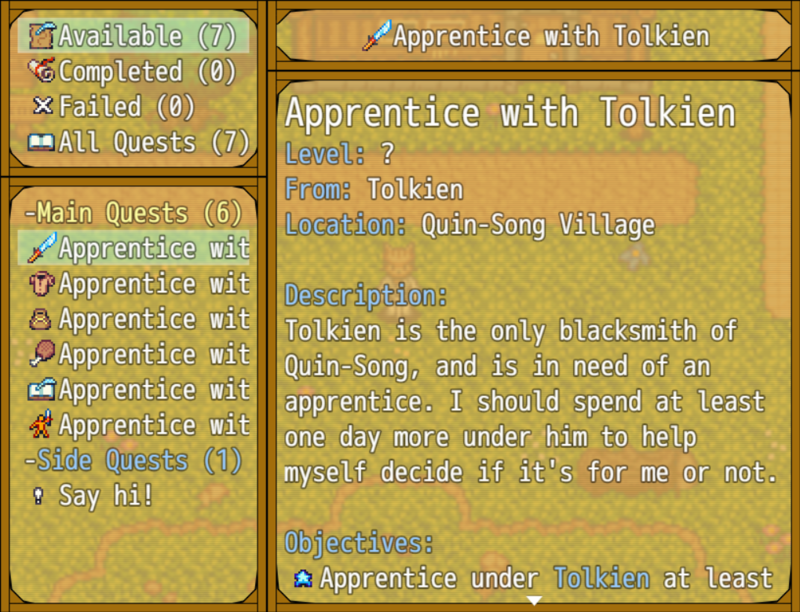 The plan is to add further apprenticeship opportunities, with further crafting and a more balanced fighting system (think of rune factory, a major inspiration for this, which has a pretty huge following). I try not to include any spoilers in my responses, but the whole rest of her journey is the potential, we only got to see her beginnings (it just happened to be longer than a typical rpg would include). Ah I hope you managed to read my mini rant, I'm still pretty passionate about the project, and I really respect you for having played and rate my game. The feedback I get really helps me grow as a game developer! Thank you very much!! I looked around the whole village and talked to everyone, then the game froze as I was leaving the empty tavern. That's very strange!! What day was it? I'll take a look at it. So sorry that you experienced that!! I guess it was day 1. I didn't accept any apprenticeships because I wanted to see who all the people in town were first. Hm I've never had a playtester come up with that bug! But I'll be sure to check it out as soon as I'm at a laptop. Its a shame you couldn't see the whole game on your first play through, but I apprecoate you bringing this bug to my attention. This new one and a problem on the 3rd day with the gnome trapping you in the cave are the two I now currently know of and will patch once the contest is over. Was there anything else you disliked about the game? Anything that wasn't clear? There's wasn't anything unclear. I didn't like the opening though. I know a lot of people find it amusing to have expectations suddenly betrayed right after they're built, but I don't like being told something only to be immediately told it doesn't matter. After that the characters didn't grab me enough to recover. Part of why I was searching the town was to find characters I liked. Ah I see! The opening cutscene was meant to moreso set up the world's overarching plot point, while making a joke out of games that start that way, but I can see how it came off jarring, I can certainly work to make it less so. I unfortunately am currently unable to recreate the bug you speak of, but I'll have some play testers of mine give it a few attempts as well so we can identify the problem! While I unfortunately have to wait until after the contest to officially fix it, know that it will be found and fixed in the future. Should you choose to give it another go, the characters do all have backstories that can be discovered by further talking to them each day, which may make them more likeable to you. Even if you don't, it's a shame my game wasn't your cup of tea, but I thank you for giving it a try regardless!!! Thanks so much!! It's getting some decent feedback I might just make a sequel!!! This was my favourite line! https://imgur.com/MOPcv5Q But then, I am a sucker for tongue in check 4th wall breaking text. Congrats on finishing and submitting your demo! Thank you so much for playing!! I'm glad you loved flirting with Shiori!! I took a lot of personal experienced into account when writing it, and I'm glad it feels genuine and sweet to most people! I'm glad we BOTH got to submit a demo!! (seriously people try this person's out it's great!) It's awesome when us devs can support each other! Why thank you! Let me know what you think! Amazing game! So many features. I like the alternative endings, and how with every different path you go to, you get a different ending! I went for Genko, and the ending was sad! The game play was cool, and loved how you actually had to work a little bit to be able to fight without dying. Thanks so much for playing!! I'm glad you enjoyed it!! It's amazing how much is in this game, there are so many features that are well executed. Getting all the different system operating in sync is awesome. This Village sim focusing on the apprenticeship process set in a world at war is a great concept. Great characters and dialog really sell it. Love this game! 5-stars! Thank you so much!!! I'm so glad you liked it! It's the kind of game I dreamed of making and I'm so proud of it. I liked your game, the little sprite were so old school haha. Even them music too! There were funny moments in the game like the intro. "this isn't going to be one of those cliche story" lol Some many jrpg's i've played hahah. The fights were a bit too tough though. And a bit too long for my taste. I died fighting the chest at lvl 2. One wrong move and it's over for me. I used staff instead of fire haha. If I had to give another playthrough through the game, I'm sure I could grind out the fights to the forest each day, but that's the devoted gamer I'm talking about haha. For the newer people, maybe you could lower the enemy hp? Instead of 4 strikes to kill, maybe do 2 - 3? and high defense? Idk.. This made my entire day!!! I was so nervous and stressed for time adding everything, it means the world to see your comment!! And thank you for the feedback about the fighting system!! It is a weakness of mine and now I know what changes I should make if I continued to work on it! I love that you made the connection to rune factory!! It was a huge inspiration! Shame you didn't make it to the ending (of which im super proud of, but I appreciate you playing at all!!! AAHH!!! People like you make the world go 'round!!! I managed to ask shiori out...And you know what? This is already too much yuri for me hahaha. Though the dialogue when matsuki is happy to actually finally go out with her sounded very genuine 0.0 That was my favorite part. After talking to shiori so many times, matsuki is hopelessly romantic lol...but good for her to finally get the girl. The ending was surprising. The game really picked up after that but it ended sooo soon after the denial factors and such when choosing what happened. That was very hooking for me. When you talk to the golden bird, she tell you about cleaning the church but cant cause of the expansion. I was laughing. You broke the 4th barrier there. After those positive feedback, imma give you some constructive feedbacks too! At the beginning of the game, the first time I played it, I couldn't tell who was the main character in the house when the family was all talking to each other. So I wasn't that attached since i had no idea who was the main character until the event ended. Thank you so much!! I planned to have more cutscenes between characters like the one between Genko and Tolkien on day 3 (bonus points to you if you noticed her anger text at the end matches his in his rant), but the time crunch was real. I just barely got everything I wanted in there and I genuinely wanted to flesh the ending dialogues more but..meh such is life. 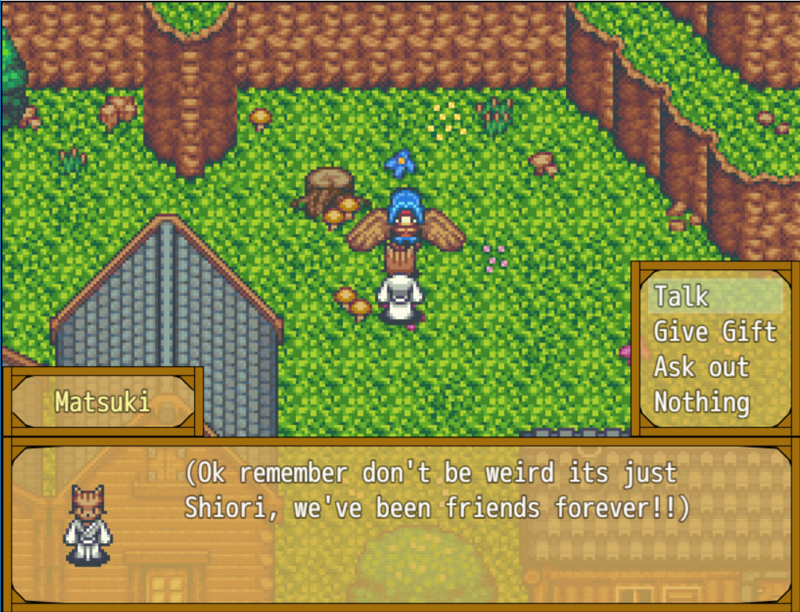 I definitely need to make it a bit more suggested to talk to everyone each day and to add further cutscenes with everyone (lol and the forest is an understandable nightmare). I actually was really proud of the text with shiori. I based a lot of it on my own relationship and I'm grateful it shined through. Thank you for giving me such thorough feedback. I saw when the first year of this contest happened, but was too hesitant to join. This is my first publicly shared game, and if it gets good feedback I'd love nothing more than to build the sequel. People like you make the world go round! !